Wow! The trip has finally started. John Leo accompanied me for this first week of the trip and today we bicycled to Monterey. Some cycling journals I've read start with a heroic and painful first day. Everything to get on the road. Fortunately, this was not such a day, but instead a straightforward, though slow-paced ride. Last minute packing at midnight and a short night sleep. Photo above shows all the gear necessary for a year on the road. We had reset our start time to 7:30am, but unfortunately I hadn't told my brother Rob who came by with pastries for breakfast. Thanks! Rob. John Leo arrived just past 7:30am. Took the classic departure shot and started on the road. The bicycle was surprisingly sluggish but otherwise rode smooth. The combined weight of myself + bicycle exceeded the capacity of my bathroom scale, but I estimate >100lbs for bike and gear. Busy commuter traffic through Saratoga and Los Gatos. Gravel creek trail around Lexington Reservoir and then up and over the hill to Santa Cruz. Descent! Lunch in Santa Cruz and then rural back roads through fields to artichokes, strawberries and other unidentified plants. Dry weather but increasingly overcast. Made it into Monterey about 5pm. Surprisingly tired out for just 73 miles. Lack of other conditioning was definitely noticeable. Picture at left shows John in front of fields of strawberries covered in white plastic. Field at right shows produce at local fruit stand. Rain showers today. Frontal system moving through with intermittent showers today, fog and mist. For a while, I had all three common cyclist laments: rain, headwinds and hills. However, as picture above shows, also some dramatic views when it was clear. Drizzle at 6am, so we waited briefly and departed Monterey at 7am. Climbed up and over the hill before stopping in at Carmel Safeway for early breakfast. From Carmel, the coast is rugged, hilly and beautiful. Just enough rain to keep everything wet from rain or sweat. Gentle rolling hills to climb up and over resulted in a slow pace. Figure this is boot camp for Australia. Made it to Big Sur about 11am for a late breakfast. Over breakfast we briefly discussed stopping in Big Sur to await the rain. I figured the weather would get better and thought it would be useful to try for Lucia 27 miles further. It turns out I was wrong about the weather, though also happy we continued on. One large hill climbing out of Big Sur followed by many small hills. Seems like I was either in my lowest gear or descending. A fog settled in obscuring some of the view but I could imagine it being dramatic. Lucia is a small town with 22 residents. We got the last dinner before they closed earlier than their 4pm time. A slow day with only twelve tables served that day. Nice to get dry in the Lucia lodge motel from a surprisingly tough day. 55 miles today, 128 miles cumulative. Looked out the window at 6am and saw clear skies! Yes! We quickly got ready and were on the road by 6:30am. First stretch continued scenic but hilly terrain. Just a few miles past Lucia was a rock fall area, lots of debris on the road and also some rocks actively falling down. Quickly and carefully cycled past there. Passed two campgrounds and stopped in Gorda for a nice breakfast. At milepost #7 the road starts to climb, reaching about 800ft two miles later. This followed by sharp descent and then a climb again. Second climb was particularly tough. I walked through one construction zone along the way. After this last climb a nice descent to Ragged Point. Tried to pick up PocketMail messages but they all came out as gibberish. Uh oh, hope it is just a local phone problem with the pay phone. After Ragged Point two more miles of descent and then flats. Unfortunately, also headwinds. Both John and I were starting to drag some against the wind. About milepost 62, stopped to view the Elephant Seals that had climbed on the shore and were lying there. A few miles further and lunch in San Simeon. We saw over a dozen local cyclists out for a Saturday ride, turning around just where we were. Joked about finding a cyclist of the right size and trading bikes for the next stretch. No luck, instead we slowly made our way southwards through Cambria, Harmony and towards Cayucos. 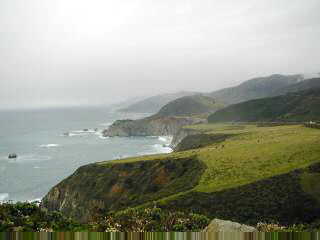 About five miles from Cayucos the first raindrops hit. Light but ominous since they were leading edge of a large storm we'd heard about for the last several days. Will have to see how much cycling we do through this next storm. 61 miles today, 189 miles cumulative. The weather channel can be a scary show for touring cyclists. Forecasts called for 30-45 mph headwinds with gusts up to 60. Heavy rain was also expected. On the road at 7am, since it looked clear. First seven miles brought us along US 1 along Morro Rock pictured above. Steady headwinds made for slow going. Started raining as we entered the city, but fortunately most of this first squall was spent as we ate breakfast at a favorite, Kitty's Kitchen. Lots of debris on the road as we went down through Morro Bay and then southwards to Los Osos. Maps indicated a small side road, Turri Road that we took. A slight break from the wind, but also a nice winding and hilly route. Windmill at right was going full speed as we passed. We crested a small rise and then down a hill. Despite a steep downhill, I had to pedal against the wind. Next stretch along the main road had some of the strongest winds. At some points bringing us to slower than walking speed as we fought against the wind in lowest gears. At a few points we got off and walked. At Madonna Road just outside San Luis Obispo, John Leo left me for this trip. Originally he had considered joining me for a week to San Diego. However, combination of weather forecasts and recurring soreness in his right knee meant that it made sense to go back to the Bay Area. Nice to have John along. Now the trip entered a long solo phase. Shortly after leaving John, road took a right and paralleled 101 heading towards Pismo Beach. First five miles through a canyon and last through outskirts of Pismo Beach. Some rain to accompany the last miles into town. Though it was only 12:30pm, decided to stop for the day. Next motels were ~40 miles down the road. As I sat reading the Sunday Los Angeles Times and looked out over the pouring rain that started not much later, felt good about this choice (though slightly worried about too much weather causing short days). I wandered around town in the rain including visiting the pier above. Also settled in to see what scary stuff the weather channel had about upcoming days. Music for the afternoon. 33 miles today, 222 miles cumulative. Heavy rain overnight, but not raining when I awoke. Headwinds also died down a bit. Decided to go for a short day and try for Lompoc. Within half a mile, I encountered what would become the first of four street closures due to flooding. Followed detour signs up the hill, along the pedestrian sidewalk near 101 and then back across the hills at Oceano. Added about a mile total to the distance. After Oceano, the road quieted down though had quite a bit of debris in the shoulders. Climbed some short sharp hills, passed a Tosco refinery and then descended off the hills into Guadalupe. Two miles out of Guadalupe was road closure #2. I cycled another half mile passed the road closed signs to see if I could get past. Nope. The road ducked under a railroad underpass. Neither walking over the overpass or ducking under seemed reasonable. Later learned that water was probably chest deep. Instead detoured past fields eastwards. Even here, one place where water from the field overflowed the road. It got my shoe wet, but fortunately wasn't up to the bottom of my front pannier. Two miles down, turned on the next road and cycled back to Guadalupe. Tailwinds! Wow, that is what they feel like! Main street Guadalupe was all torn up, so cars behind patiently followed a lone cycle tourist riding southbound. Most signage and shops were spanish. Stopped for breakfast of eggs, beans and toast. Breakfast was also good time to catch up from locals about road closures. Apparently, main road #166 from Santa Maria had also closed. Opinion was that there might be local flooding near the golf course but otherwise reasonable to Lompoc. South of Guadalupe, the road got nice and quiet though a bit windy. See image at right. After a few miles, the first downpour hit. Solid rain with headwind to push it into my face. Oh boy! 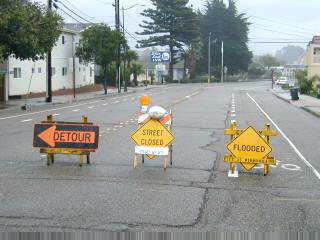 Just prior to Orcutt, I came upon road closure #3. A pickup coming the other way stopped and indicated that he'd just come through and there wasn't much problem. Off I went past the golf course. As reported, there was previous signs of mud on the road, but not much topping the road as I cycled past. Shortly thereafter road merged with the main road, 135. Lots of high speed traffic on this two lane divided highway. Trucks would leave behind their spray of water as they passed. Climbed along this road up and over a hill and was pleased to have the main route (#1) depart leaving a quieter (#135). The plan was to climb on a small steep road over the Harris Grade and via the back route to Lompoc. Just where the divided highway became two lanes each way was the fourth "Road Closed" sign. Not to worry, I saw San Andreas Road and cycled off to the right thinking this was my route. It was raining a bit much to check the map anyways. A short while later, a pickup stopped and the driver told me about a mudslide ahead. Might be possible to walk around it but otherwise road was blocked. As I got to the slide, I got off my bike and walked around the right side. I lifted my bike up as the brown gooey mud came over my shoes, yuck! Once past the blockage I continued cycling along. Something seemed wrong...the road was going along the valley but not climbing on the grade. After about four miles, I found myself back at US 1. Sigh, I had made this detour including mudslide in vain. Back on busy highway #1 as it climbed a considerable hill and then came via the main entrance to Vandenburg Air Force Base, US Space Command. Southbound here and across some sharp rolling hills before arriving in Lompoc. Another storm day on the road. 45 miles today, 267 miles cumulative. Rain day today. TV says my expected route, highway one south from Lompoc, was closed due to mud slides. Later reports indicate it will be closed for 4-5 days. Also, heavy rains overnight (6.81" total rainfall just on Sunday/Monday in Lompoc) and more forecast today so decided to take a day off. Music for today. Found some interesting murals around town and also investigated the highway one closure further. 0 miles today, 267 miles cumulative. Nice day at last! Left Lompoc without headwinds and without rain for a change. A few miles down, I passed the "Road Closed" cones and barricades and made my way along Highway One. From previous day's reconnaissance, I guessed it was likely I could get through. It would also save at least 1300ft of climb when compared with San Marcos Pass. Road was peaceful and quiet without the traffic. Sun shone brightly and all was green. A gentle climb with some ups and downs. Occasional instances of debris on the road where a small slide had spilled mud over the road. First major hazard was approximately seven miles down the road. A crew was busy with front end loader and dump truck, removing several hundred feet of slide from the road. They had done a good job so far, except for getting mud over everything, the road was easily passable. Two miles later was a more significant hazard. As seen by picture above, a giant sinkhole opened up and collapsed the road by about five feet. Fortunately, was able to walk through mud at left side of picture to make my way. Hooray, gamble on the closed road pays off! Finished climbing up to 900ft before two miles of steep descent and rejoin highway 101. Lots of traffic, but also an ok shoulder. Stopped briefly at a rest area and then cycled an additional 20 miles along the shoulder of the freeway. Isla Vista, Goleta, Santa Barbara. Major urban area, but fortunately, reasonable cycle routes. Picture at right shows dolphin statue downtown by the waterfront. Stopped briefly for lunch in Summerland and then continued along the coast. Much of this next stretch was on a secondary road paralleling 101. Nice beaches and waves washing ashore. Also a few stretches on 101 itself, but fortunately, reasonable shoulders. Met a loaded cyclist coming the other way, trailer and all. Destination Alaska...still a ways to go. We traded information about road conditions, sinkholes and campgrounds and set off on our ways. A short stretch of bicycle path leading into Ventura and then nice motel beckoning and a good excuse to stop for the day. Music for today. 85 miles today; 352 miles cumulative. Bicycled through most of LA today. Took a bit of coordination and nerves to ride the combination of busy city streets and crowded bike paths. Left Ventura to another wonderful day. Back streets along the bay and through Oxnard. Route crosses industrial zone and included two small power plants. Near Port Hueneme, lots of Navy presence. A construction base and many other signs. Picture of "bicycle rocket" above left shows one exhibit from about a dozen rockets and airplanes in a small park about 16 miles from the start. Soon thereafter rejoined Highway One. However, the freeway quickly ended and the route became a beautiful, though busy ride along the Santa Monica Mountains, shown right. Rode very carefully watching for glass on this stretch as previous trip (in '98) remember having two flats here. After the county line, the road widened to two lanes each way. Who put the hills in Malibu? Nothing severe, but next fifteen miles included several small rises to climb only to descend a bit later. Unfortunately, a garbage truck and I were evenly matched for several miles. He'd pull over to load a dumpster from the side of the road. I'd pass only to have him pass shortly thereafter. After Pepperdine University, the shoulder I'd been sharing with the garbage truck mostly went away and simultaneously, traffic started getting heavier. Had to concentrate carefully until milepost 37 where a beach bike path started. Next 20 miles mostly on bike paths through Santa Monica, Venice Beach, Marina del Ray, El Segnundo, Hermosa Beach and Redondo Beach. As shown at left, stopped in Venice Beach. Not for a tattoo or a pipe, but for lunch instead. Rode right under flight paths for LAX. After Redondo Beach, the route rejoins the Pacific Coast Highway (PCH) for a busy and sometimes hectic ride. Particularly past the port of Long Beach with rough roads, many trucks, heavy traffic. Senses on full overload navigating bike over rough streets and busy roads. Interesting smells along the port as well. Decided to stop before the worst of rush hour, though believe have made it through the worst of LA and only about a mile and a half from Orange County. Music for today. 89 miles today, 441 miles cumulative. Last day riding along the coast. Left Long Beach on wide road and soon crossed over into a succession of beach towns: Seal Beach, Sunset Beach, Huntington Beach and New Port Beach. Huntington Beach was supposedly where surfing originated and I saw quite a few out with their boards today. Overcast skies bordering on drizzle, but got better as the morning went on. I had been having difficulties connecting via phone for either calling card or PocketMail. Hence, dropped a disk with the web site in the mail in Laguna Beach. Laguna Beach another town with a surprising number of short quick hills...though the downhill side was always quicker than the up. The stretch through Laguna Beach would not win any awards for favorite route. Heavy traffic and not much shoulder. In San Clemente the route left the PCH and went through small side streets as shown as right. Fun, particularly with many short sharp hills. After San Clemente, passed the San Onfre nuclear plant and then a campground for three miles. Thereafter, the next twelve miles were through Camp Pendelton. The guards looked at me strangely and even carefully checked my ID, but fortunately let me through. Perhaps a slow day on guard duty? Saw numerous "tank crossings", though only a few armored vehicles. Did get muddy in one stretch where tanks and bicycles share the road. Got into Oceanside early in afternoon. From here the route will take me eastwards, so otherwise also a good place to stop. Music for today. 64 miles today, 505 miles cumulative. Go east, Young Man! With that corruption of Horace Greeley's charge, I set off eastwards across the US on my "warmup ride". Not quite certain what I'll call the ~500 miles before that. A brisk wind to start. It waited until I was a mile from the start before the rain shower started full blast. Road was wide with two, sometimes three lanes of traffic and a wide bike lane. Traffic on a Saturday morning was light, though throughout the day I saw a surprising number of pickup trucks hauling motorcycles and desert buggies. Folks off to play in the desert. Squish, squish. The rain had stopped, but I was still soaked as I made my way into the Bonsall Burger King for breakfast. Another patron and I had one of those brief obvious conversations, "looks like you got wet". We looked at each other and laughed. Outside the BK stood about fifteen men. I assume a temporary labor pool waiting for someone to pick them up and pay them for a day work. I later saw enough oranges fallen from the trees (see above left), that sure would have been nice to match them with workers. Fortunately, after Bonsall, stopped raining and sun even came out. Crossed over I-15 and slowly followed the river upstream through Pala and Pauma Valley. Reservation country and included a new casino being built in Pala. Several nurseries and lots of orange trees. Rincon was at mile 33 and elevation 900ft. The next five miles, the road quickly climbed to almost 3000ft. Slow going as I hauled my load uphill. At mile 38 was a turnoff to Palomar Mountain including its observatory. Cars coming down had snow on their roofs. A descent from Palomar followed by further gentle climbing along the river to Henshaw Reservoir at 2800ft. Here a short lunch where had conversation with Mike. Decided to make a reservation in Julian since skies were looking ominous and still had a good bit to climb. Was so preoccupied with this, that left lunch without paying. Oops! Fortunately, Mike was helpful enough to catch me a few miles down the road and return to Henshaw Cafe to pay my tab. Road to Santa Ysabel had a fair sized hill to climb and then descend again. Santa Ysabel was elevation 2964ft. From here, a steady climb to ~4200ft and Julian. Skies overcast with drizzle. It had snowed the previous night and there was a fair bit of snow on the sides of the road. Welcome sign at end of day. White stuff is snow. Music for today. 67 miles today, 572 miles cumulative.